Jeffrey Lionel Wadley lived at Selbourne in early years but for most of his life he enjoyed living at ‘Westfield’, the 1825 Westbury property, with his loving wife Elizabeth and their six children. Jeff Wadley was the informative voice for woodchopping, on television, around the agricultural shows and in the printed media. His outlook was positive, considered, progressive and entertaining. 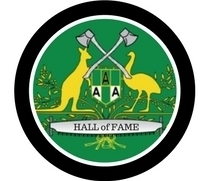 Jeff was President of the Northern Tasmanian Axemen’s and Sawyers’ Association for 32 years (the association established in 1932). He was President of the Tasmanian Council of Axemen’s Association and “he was largely responsible for the formation of the Australian Axmen’s Association, when he was chairman of a meeting of representatives from all states, called at Ulverstone in 1970. He led the Australian Axemen’s Association for three years. A thorough and tenacious worker, he was active in co-ordinating chopping within the state and organising the supply of blocks, programming, prizes, fund-raising, entries and publicity for many events. He diligently promoted the sport and corresponded with teams interstate and internationally. In 1979, as competitor and Team Manager, he travelled with an enthusiastic group of sports men and families to Perth and Mildura. (Competitors including Ian and Duggan, Peter Foster, Garry Lovell, John Timbs, Eric Farrow, Greg Lovell, capt., Stan Saintly, Bill Youd, A.G. Lofty Grave, Tas. President). 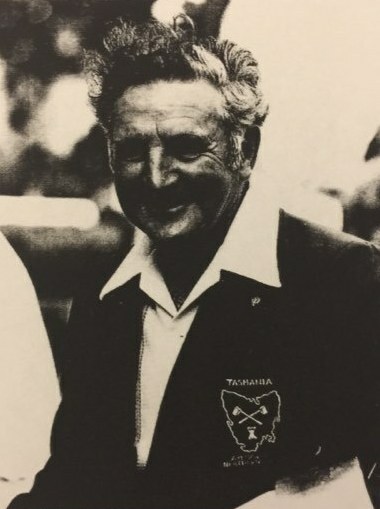 IN 1981, Wadley was Manager and President of a triumphant Tasmanian team which toured New Zealand (they won their final Test Race Austrlaia – 2, NZ – 1). David Foster, Greg Lovell, Ian Duggan, Gary Hewitt, Martin O’Toole, Lawrence O’Toole and Jeff made up the team for the Thames International Teams Race. Jeff Wadley was not only a fine administrator, he was a cheerful person who enjoyed success as a sportsman in his own right. A keen cyclist, fisherman, footballer, cricketer and woodchopper, he was a regular competitor and lvoed tne companionship and excitement of the arena in Tasmania and other states. Amongst his triumphs were the third prize in the World Woodchopper Heat of the 1000 at Glenorchy in January, 1971 and the award of Axemen of the Year Jan/Feb ’81 at Henley on the Mersey. President of the Westbury Rotary Club for many years, Jeff Wadley was a community minded person as many of the chopping community are and in their whites and greens, they were regularly raising money of taking up a collection in the area for a worthy cause.